From Philippi, saint Paul and his companion Silas visited Thessalonica about 50 A.D.
Casander (who was a general in the army of Alexander the Great) had founded Thessalonica in 314 B.C. Located in northeastern Greece, the city was named after Cassander’s wife (who was also Alexander’s half-sister). 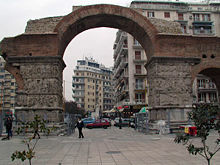 Thessalonica was the chief port and the capital of Macedonia. The Romans annexed the city in 146 B.C., and it had become the seat of the Roman proconsul when Paul visited it. The prosperous city had a large Jewish community and synagogue which (“following his usual custom”) Paul visited several times to discuss scripture and to talk about the Messiah. When Paul left Thessalonica and traveled to Athens and Corinth, he left behind a youg follower named Timothy. Timothy was the son of a Jewish mother and pagan father, and Paul encouraged his work among the Jewish people of Thessalonica. Paul’s first letter to the Thessalonians is his reponse to a report from Timothy on how the Christian community there was doing.